Mind you, my husband Tony and I are no strangers to fine cuisine, as we have our share of five-star restaurants in our home town of San Diego. While I was indeed interested in sampling some authentic local favorites during our visit to the Crescent City, I was also in quest of a dining experience that combined not only excellent cuisine, but also traditional jazz, history and the ambiance of yesteryear. We found what we were looking for—and more—at Arnaud’s Restaurant, where we spent two delightful hours enjoying their celebrated Sunday Jazz Brunch. This venerable establishment, located in the heart of the French Quarter on the corner of Bourbon and Bienville Streets, was founded in 1918 by a French wine salesman, “Count” Arnaud Cazenave, though the building in which it is housed actually dates back to the 18th century. 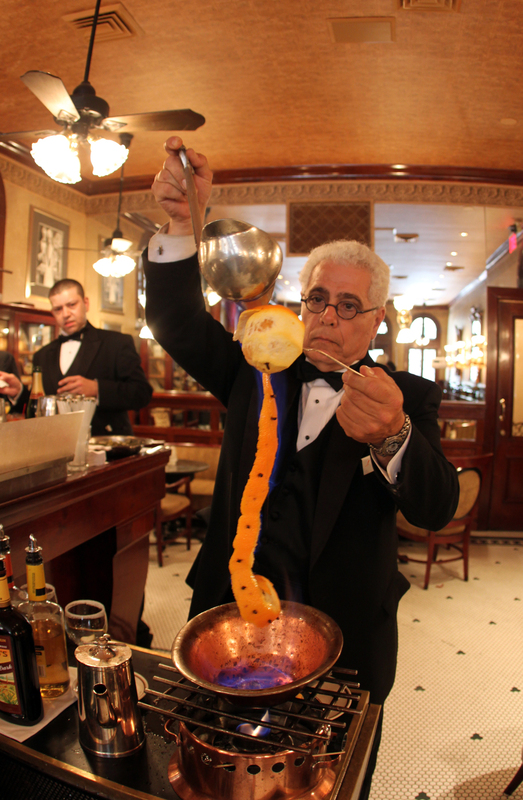 Even if food isn’t on your mind, the main dining room at Arnaud’s is worth a visit just for a glimpse of the past; it is a scene out of a period of time when grace and hospitality defined one’s lifestyle. With its crystal chandeliers, mosaic-tiled floors, stately columns, tin ceiling and beveled glass windows, the room is grandiose without being pretentious. Yes, there are tuxedo-clad servers who attend to your every need, but the atmosphere is never stiff or overly formal. We felt immediately at ease, reveling in the sounds of a talented traditional jazz trio that made its way around the room taking requests and personally serenading the delighted diners. I knew I was in the right place when I picked up the menu and found this statement on the cover: The Art of Cooking is an art to be proud of. It is the soul of festivity at all times and to all ages. A dinner chosen according to one's needs, tastes and moods, prepared and well served, is a joy to all senses. Sunday brunch at Arnaud’s consists of a four-course “prix fixe” option, with the price of the entrée the cost of the entire brunch. Our appetizers included the traditional breakfast starter, “Creole Cream Cheese Evangeline,” which consisted of fresh fruit atop a wonderfully light mixture of sour cream and crème fraiche. It was the next appetizer, however, that opened up our palates to New Orleans cuisine. One taste of the restaurant’s signature dish, Shrimp Arnaud, convinced us that we would forever be friends of French Creole cuisine. I’ve always been a fan of sweet gulf shrimp, which I’ve enjoyed while visiting Texas and Florida, but I simply never tasted a remoulade sauce quite so divine as the one on this particular dish. I later learned that the secret recipe, developed by Count Arnaud, has been kept under lock and key over the decades, so the only place to truly enjoy the wonderfully flavorful sauce is either dining at Arnaud’s , or by procuring a bottled version on line (http://store.arnaudsstore.com/remouladesauce.html). Our next course was a crisp salad of romaine lettuce, celeriac and pistachios, served with Arnaud’s House Dressing, which was a delightful mix of creamy Caesar and ranch dressings that complemented the greens perfectly. In between courses, we sipped excellent mimosas that cleared the palate for our entrees, while listening to our jazz trio’s mellow sounds and basking in the ambiance of old New Orleans. It was a challenge to choose between the many inviting entrees that appeared on the menu, but we finally settled on another signature dish, Arnaud’s Crab Cakes ($39.95). Needless to say, we’ve feasted on many a crab cake in our days, and Arnaud’s presentation was right up there with the best we’ve ever tasted, enhanced by a white remoulade sauce that was again, quite spectacular (and most likely another secret recipe created by our Count!). No brunch at Arnaud’s should end without their signature dessert, a true local favorite, Bananas Foster. This decadent concoction is made right before your eyes; if you are counting calories, turn your head away. A rich glob of butter is added to the pan, followed by bananas, cinnamon, and brown sugar, flamed tableside with banana liqueur and dark rum and served over French vanilla ice cream. If you are going to sin in New Orleans, do it with this dessert! Our adventure didn’t end with dessert. After enjoying a cup of Café Brulot (flamed tableside for another dramatic touch), we were invited to tour the Mardi Gras Museum on the first floor, which is open to the public free of charge during restaurant hours, seven days a week. The museum is named for Germaine Wells, daughter of our famous Count, who reportedly reigned as queen of over twenty-two Mardi Gras balls from 1937 to 1968, more than any other woman in Carnival history. The lavish gowns, which also include the Count’s and children’s costumes, are beautifully displayed in glass cases and feature detailed bead-work and trim. The collection is enhanced by more than 70 vintage photographs, intricate Carnival masks and faux jewels, and elaborate party invitations and favors. Our love affair with Arnaud’s did not stop at Sunday Jazz Brunch, I might add. During our exciting week in the French Quarter, we returned to Arnaud’s historic bar, French 75. Intimate, quiet, and classy, sitting in this setting sipping a Sazerac (rye wiskey, sugar and bitters, again flamed in front of your eyes) or a deliciously potent French 75 (Courvoisier, sugar, lemon, Mumms’ Cordon Rouge) brought us back to the days of yesteryear with its intimacy and romance. The cocktail selection was vast (and I must admit, quite intimidating for us Southern California folk with our penchant for wine and ignorance of the wide variety of historic cocktail drinks available in New Orleans). However, that didn’t stop us from enjoying the opportunity to sip our share of Arnaud’s offerings. The quote from W.C. Fields on the Arnaud’s appetizer menu put a smile on our faces as we sipped our libations: “I never drink water. I’m afraid it will become habit forming.” The Brandy Milk Punch seemed innocuous enough, but it did deliver quite a “punch,” as did a superb Bloody Mary with Creole seasoning that carried a kick thanks to the spicy hot sauce and a generous portion of vodka. While the cocktails are exceptional at French 75, the appetizers are equally as stellar. The Souffle Potatoes ($8.95) were lighter than air and came in a generous portion complete with dipping sauce. We also enjoyed a plate of hickory-smoked fresh Gulf pompano, served on toast points accompanied with sour cream, capers and onion ($8.50). Oysters En Brochette ©Joanne DiBonaOur absolute favorites on the appetizer menu were the Brie and Jalapeno Stuffed Shrimp ($8.50) and the Oysters en Brochette ($12.25), succulent Gulf oysters wrapped with bacon and deep fried with a tangy wine sauce on the side. Cigars, incidentally, are welcome in French 75 and are available at the bar in their own special humidor. Our impression of Arnaud’s—and all we experienced on our inaugural trip to New Orleans—was summed up beautifully by our charming hostess Lisa as she led us through the Mardi Gras Museum and the several private dining rooms available for intimate events in rooms that are decorated in the style of the great French chateaus. She explained that New Orleans is the city of eternal improvisation, be it in music, cuisine, or personal style. It is this spirit that pervades this magical city and makes this destination one that will never lose its appeal to those who open their hearts and connect with its soul.